"I'm a chile pepper nut from South Carolina. 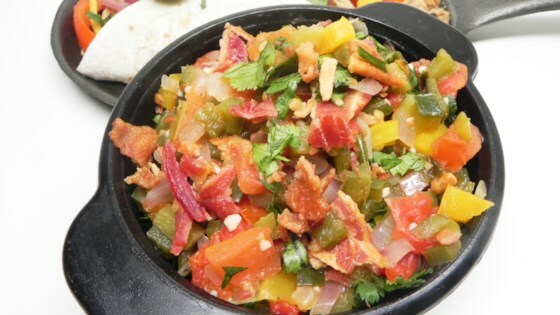 This is an awesome recipe I adapted from a Chilihead in East Texas; it's great if you like fresh salsa. This can be eaten with tortilla chips or as a soup!" Cook bacon in a large skillet over medium heat until it releases it's oil and begins to crisp. Strain out bacon, and pour off all but 1 tablespoon of bacon grease. Stir in the red onion, garlic, green onions, green bell peppers, yellow bell peppers, jalapeno peppers, poblano peppers, mushrooms, and roma tomatoes. Pour in the canned tomatoes and lime juice. Season with cilantro, salt, and black pepper. Bring to a boil, and then reduce heat to medium-low; simmer until the sauce reaches desired consistency. Watch the crew at Allrecipes make a top-rated cheese ball on the Better Show.